International departure taxes of $128 plus current fuel surcharges of $350 are included (subject to change). Today our pilgrimage begins! We depart the for Warsaw, on our transatlantic flight aboard a wide-bodied jet. We enjoy in-flight movies, dinner and breakfast aloft. This morning, we arrive in Warsaw and are greeted by our Unitours tour guide who remains with us for the duration of our pilgrimage. We celebrate Mass at St. Stanislaw Kostka’s Church and pay homage at the burial site of the Blessed Jerzy Popieluszko. Known as the “Messenger of Truth”, Father Jerzy was born in 1947 in the small village of Okopy. His parents Wladyslaw and Mariana were devout Catholics. He was a remarkably brave Polish priest who inspired all Poles to demand their God-given right to live as free men and women. We enjoy a welcome lunch together and experience a city tour of Warsaw. This city has a rich history, as a splendid 17th century capital that was greatly affected by WW2. We continue to our hotel for dinner and overnight. This morning, after our daily included breakfast, we enjoy a guided tour of Warsaw. We see Lazenkowski Park graced with the Frederic Chopin monument, then stop at the Warsaw Ghetto & Umschlagplatz. We pay our respects at the Tomb of the Unknown Soldier, and see the Palace of Culture and Science, a gift from Stalin. We travel on Krakowskie Przedmiescie, the most prestigious street in Warsaw, to the Old Town Market Place (a UNESCO World Heritage Site) and the Royal Castle. Our city tour ends at St. John’s, the mother church of the Archdiocese of Warsaw. After free time for lunch, we will take a short excursion to the Niepokalanow Monastery, the friary of St. Maximilia Kolbe. We celebrate Mass in the simple chapel founded by the saint. We visit his monastic cell, view his relics and then enter the modern basilica that stands on the site. Dinner and overnight at our hotel in Warsaw. Today, we journey south towards Czestochowa. Upon arrival, we tour Jasna Gora, undoubtedly the most important pilgrimage site in Poland. We see Our Lady of Czestochowa a revered icon of the Virgin Mary, also known as the Black Madonna. This icon has been associated with Poland for over 600 years. Saint John Paul II secretly visited Our Lady of Czestochowa as a student pilgrim during World War II. We celebrate Mass followed by free time to further explore the museum. Lunch is on our own. This afternoon we continue to Auschwitz, also visited by JP2 during his later pilgrimages to Poland. We pay homage to all who died during WW2 and also visit the prison cell that has since become a shrine to St. Maximilian Kolbe, who offer his life so others could live. He was canonized a saint by Saint John Paull II in 1982. Upon canonization, the Pope declared St. Maximilian Kolbe a martyr of charity. Dinner and overnight at our hotel in Krakow. This morning we enjoy a tour of magnificent Krakow. Drenched in Gothic, Renaissance, and Baroque architecture, it is revered as one of Europe’s most beautiful and unique cities. We tour the Wawel Cathedral and the Royal Castle on the banks of the Vistula river. We visit St. Mary’s Basilica with its famous altar by Veit Stoss, Saints Peter and Paul Church to celebrate Mass and then stop in the largest medieval market square in Europe, the Rynek Glowny. 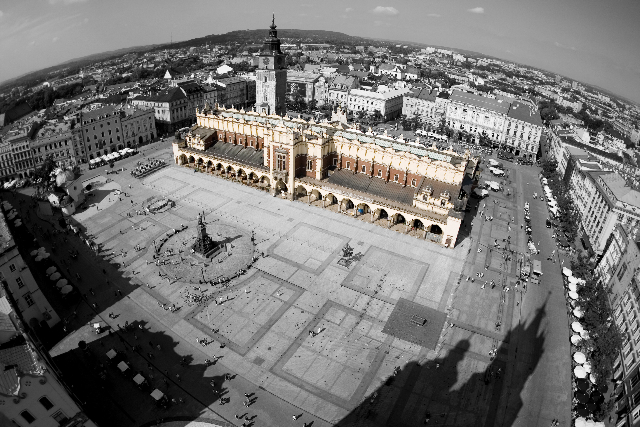 Kraków is also home to Jagiellonian University attended by JP2, one of the oldest universities in the world and Poland’s most reputable institution of higher learning. We also see the Archbishop’s Palace, where JP2 lived as a cardinal, and visit the Franciscan church where he prayed. After free time for lunch, we head to Wieliczka. Here we descend into one of the most famous salt mines in the world. We visit the underground chapel, an experience you will never forget. Dinner and overnight at our hotel in Krakow. This morning, we journey to Lagiewniki –the “Center of Divine Mercy,” a Catholic Basilica, dedicated to Divine Mercy devotion, and the final resting place of Saint Faustina Kowalska, who was canonized in 2000. We celebrate Mass here. We also visit the sanctuary where we find the famous painting “Jesus, I trust in You”. This painting was based on the visions Sister Faustina had of Jesus. We have some free time for exploring the Divine Mercy Center, before we head over to the beautiful John Paul ll Centre, opened in 2016 for World Youth Day. This afternoon is free for personal adventure including walking the beautiful river walk park or possibly visiting the Oskar Schindler museum, or other museums in Krakow. Dinner is on our own tonight. Overnight at our hotel in Krakow. Today is the highlight of our pilgrimage. We head to Wadowice. It was here that JP2 was born on May 18, 1920. Today marks the 100th Anniversary of his birth. We join the festivities and attend the Mass in his honor at his parish church. After an included lunch, we visit his home and the church where he was baptized. As we journey back to Krakow, we stop at the Basilica of Our Lady of the Angels in Kalwaria Zebrzydowska. This shrine is devoted to St. Mary and to the Passion of Christ and is the oldest and biggest Calvary in Poland. Tonight, we visit a restaurant in Krakow and enjoy a traditional meal together and celebrate Saint John Paul 2! Overnight Krakow. This morning we transfer to the airport to begin our journey home to the USA. We are filled with stories to tell and memories to last a lifetime!